Alexis Morrell Carrington Colby Dexter Rowan: [to Sammy Jo] Your days are numbered, bimbo. I was, like any other "Dynasty" fan, happy to see the cast back after a couple years away. This reunion movie answered some questions (rather indirectly) from the series' cliffhanger as to who survived the balcony scene, etc., and certainly delivered on the catfight quotient (who would have thought feathers could fly like that?). 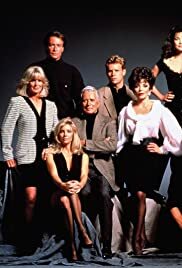 The recasting of Adam was a disappointment; Robin Sachs just didn't have the zest of Gordon Thomson (who had taken over the wonderfully zesty role of Mason Capwell on NBC's daytime soap "Santa Barbara"). But the return of Al Corley, who frankly, was always three times as HOT as Jack Coleman (and I'm not even gay -- or male!) as Steven just about redeemed that. The storyline with the Marshalls and Jeremy Van Dorn was fair, but Sammy Jo! Oh, we were so disappointed in the direction Sammy Jo went with this one! She was voted BRBTV's most matured character over the course of the series run, evolving from a sleezebag opportunist into a smart businesswoman, but here in the reunion movie she de-volves back to just about zero. Yikes.